We are very proud to have been appointed as the specialist tour operator to run Oxford and Cambridge University’s scholar-led group tours in Latin America. Open to all alumni of either university, or those with a close connection, each of these small group trips (maximum 20 participants) has a theme that reflects the knowledge and expertise of the chosen trip scholar. A fascinating introduction to the wonders of Peru's fauna, from Andes to Amazon. This tour includes Buenos Aires, Patagonia, the Lake District, and culminates with the 14 December 2020 total solar eclipse. “Inhabiting the Andes”, led by Dr Nicholas James. 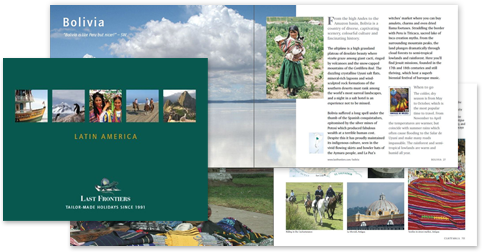 We publish (and give all our clients) our very own hardback Guide to Latin America, 176 pages of lovely images, sensible ideas and hopefully more than a little inspiration! If you have not travelled with us but would like a copy it is available on Amazon.co.uk. We will refund the cost if you book a Last Frontiers holiday!